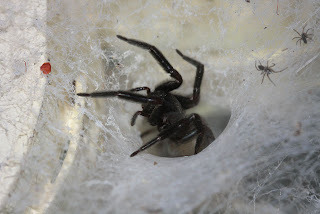 The Spiderblogger: She's Wonderful - I have an orb weaver! She's Wonderful - I have an orb weaver! This summer has been horribly dry and hot. The spider numbers are woefully low as are, not surprisingly, the insects. I thought I had no orb weavers. I had seen hints of silk of one at the end of the verandah, but had never seen her. Tonight the silk was reflecting clear - it was fresh and crossing a span of two metres. She had to be there somewhere. 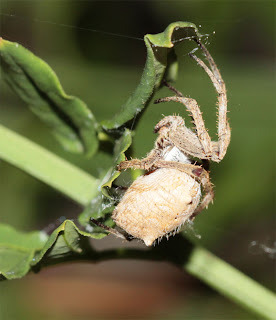 Trying to follow the silk, I felt something against my arm - something about the size of a mature female garden orb weaver. I moved away immediately, hoping that I hadn't hurt her web. And I found her! She's Wonderful! The two protrusions on her 'shoulders' and then more on the end of her abdomen tell me that she's an Eriophora pustulosa. She had dashed over to the edge of her silk line, attached to which was only the remains of what had been a full orb. She'd clearly caught prey earlier in the evening. I couldn't get a good photo without disturbing Wonderful, so you'll have to make do with bum-shots. She's repairing her web - you can see the globules of glue in one silk. She wouldn't come out of the protection of the leaves while I was there. I have been negligent about blogging - I've been preoccupied with completing my PhD thesis (not about spiders) and then redrafting it for publication as a book. But that is done and my spiders can take priority again. There are so many fewer this year than usual, but of course there are the daddy long-legs (Pholcus phalangioides). And I always have my favourites, the blackhouse spiders (Badumna insignis). They've been breeding with gusto. Their stories will be told here. I will also include photos from those who read this blog and send me images. The Spiderblogger returns! Yay. I have been hoping for more spider posts from you. Somehow, the wild ones are much more precious than the kept ones. Thanks, ZBra. Your comment is much appreciated. I find both really interesting. We aren't allowed to keep the New World tarantulas here, so I find posts about them fascinating. Our Old Word species aren't so docile. But I do love getting to know individuals in the wilds of my garden. Any chance I can have a few of your tarantula photos to put here? Then I can blog about the New vs Old World species and our quarantine rules (which I support totally). I would give you credit for the photos, of course, and include the information you send.